Agriculture accounts for almost 30% of the average GDP of the economies of East Africa countries (Kenya, Tanzania, Uganda, Rwanda, Burundi and Ethiopia). It also provides employment and livelihood for more than 40% of people in the region. However, with a combined population of 249.9m people based on 2014 estimates, and a youth unemployment burden that ranges from 10.7% in Burundi to 17.1% in Kenya – with Rwanda being an exception at 0.7% –; it remains a veritable opportunity for promoting youth livelihoods development. Therefore, when the Society for International Development (SID) brought together different stakeholders in the East African Community (EAC) agriculture sector to diagnose the key drivers shaping the agricultural sector in East Africa, with a focus on youth livelihoods and employment; it was not shooting in the dark! The workshop participants included representatives of farmers groups, pastoralists, commercial agricultural producers, academia, government agencies, women, youth/young professionals in agriculture. I had been proposed by Dr. Robin Bourgeois, the Senior Foresight Expert of the GFAR Secretariat to participate on his behalf, as the lead of a session on agricultural future scenarios. Dr Bourgeois is the coordinator of the GFAR Forward Thinking Platform, to which I belong as YPARD youth Ambassador and focal point. The organiser accepted not only for me to lead the foresight session but to participate all through the workshop as a young African professional in agriculture. Quite a great recognition, trust and empowering experience for a young professional! Robin had handed over the prepared content to me and we had a set of discussions to work together on the best approach of facilitation that would help drive the kind of exchanges we envisaged. An outstanding example of inter-generational collaboration and knowledge transfer! And all was set for me to lead my first foresight session. On a hot and drowsy East African afternoon, and with the support of Aidan Eyakuze and Arthur Muliro of the SID who were the moderators of the workshop, my task was to get the stakeholders in attendance to imagine a set of future scenarios of agriculture and rural areas based on global and regional trends and drivers; and, also, to think of probable disruptions to these trends in the East African context. For many participants, who were only being introduced for the first time to foresight and futures thinking, this proved very much challenging in the beginning. But with the method of facilitation earlier devised, based on group discussions and interactions around each identified scenario, and a lot of explanation of the basics of future thinking, it was quite fascinating to see the transformations from that of initial puzzlement to highly engaging discussions and group outcomes. At the end of the session, participants identified key drivers influencing agriculture in the region – both based on global trends and those peculiar to the region. Issues like urbanization, globalization, increasing trend towards mass production for mass consumption, high standardization of agriculture produce, inadequate protection for smallholders, and a lack of political will to make tangible investment in rural areas were identified as cross-cutting drivers for the more unfavourable rural future scenarios. On the other hand, infrastructural development, change in habits and norms, favourable government policies and increased public/private investment in rural areas were seen as positive drivers towards the more satisfactory plausible future scenarios. While political disturbances; change in governments that may lead to abrupt change in policies, instability/insecurity and wars are seen as potential disruptions to the identified future scenarios of rural areas and agriculture in East Africa. 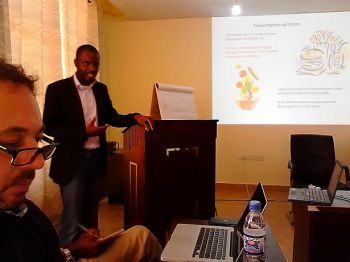 Besides, another exciting thing about the workshop was the strong presence and contributions of youth/young professionals – especially YPARD members – from the five countries of the EAC. These young people actively put across their knowledge and experiences, particularly in the areas of present challenges, opportunities and main drivers preventing more youth from going into agriculture. Recurring issues like access to land and finance, unfavorable laws and customs were dissected at the country level. Overall, it was a very interactive and engaging event with collaborative outcomes based on inputs from the seniors and the youth. The current state of agriculture in the region, the plausible future scenarios and drivers and trends that have led to the present and are shaping the futures identified were discussed. In the end, research proposals based on the analyses were put forward, to be conducted at individual country level. The outcomes of those proposals will provide current hard data that will feed into policies to promote youth employment in agriculture in EAC countries. PS: A friend and a colleague jokingly wrote a comment on a picture of me while facilitating the workshop, on Instagram: “You almost look like you know what you’re talking about…” Thinking about it as I write this, I realize the power of knowledge transfer and having someone (a senior professional) to provide active guidance.